For most of the time since Vatican II liturgists have spent a lot of energy trying to promote the idea that Advent is not a penitential liturgical season. A recent heated inter-change with an aging religious sister who was formed in the sacred Liturgy in the 1980s demonstrated to me that the obvious was missing from “Sister’s” understanding of the nature of Liturgy and her seasons. The downplay of the penitential character of Advent is, in fact, not merely misleading as I would say rather wrong especially if you look at the totality of the liturgical season. Of course, the nature of penitence during Advent is different from Lent; and no one of right mind would claim that Advent and Lent have the same degree of penitence. The Scriptures and prayers chosen for Advent’s Masses and the Divine Office all point to the removal of sin and repentance and conversion; plus, the choice of saints honored in Advent also point in the direction of Advent’s penitential character. The source of the wrong thinking is likely the fact that some professional Catholics who had a hand in framing a “new” liturgical sensibility in the Catholic Church –as if we really needed a new view– really didn’t like the notion/reality of sin, penance, repentance, etc. 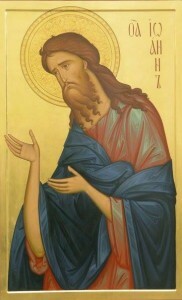 The fear-based aspect of religion prevalent in former years was likely disproportionate to a human and religious reality (think of the Irish emphasis on sin); no doubt you can’t dismiss the fact that sin breaks a relationship with God and if not taken care of with the sacrament, it leads to a radical separation that could prevent one from entering into beatitude. A mature Catholic spiritual life has the emphasis on being healthy, reasonable, human and merciful. A mature spirituality is one that takes responsibility and realizes that humility goes a long way to wholeness and holiness. Pope Francis emphasizes this fact. The capacity to admit we are wrong, that we are imperfect, that we truly desire holiness is the point of true penitence. A Christian life is only possible with a purity of heart. The right-ordered penitential life is only accomplished in conversation with a prudent spiritual director so that one is able to strive for greater coherence and integrity, purity of heart, and single-mindedness. The Advent hymn “People Look East”has real currency here: “Make your house fair as you are able, / trim the hearth and set the table. / People look East and sing today: / Love the Guest is on the Way.” Indeed, let’s get ready to receive the Divine Guest. Have we made way for the newborn Prince of Peace? How crowded are our hearts and minds for Jesus? I tried to receive the sacrament of reconciliation today while I was NYC today with a friend. But I was frustrated because the priest left the confessional early. I was little annoyed –well, it was more than a “little annoyed”– because I blurted out: “I guess Father is unaccustomed to working that he couldn’t wait to the end of the scheduled time.” Advent is a great time for priests to spend more time, not less, in the confessional. Being set free from sin to worthily receive the Eucharistic Lord at Christmas is beautiful and necessary thing. What does preparing the way of the Lord mean? “To prepare the way” means to pray well; it means thinking humbly of oneself. We should take our lesson from John the Baptist. He is thought to be the Christ; he declares he is not what they think. He does not take advantage of their mistake to further his own glory. The Church celebrates the third Sunday of Advent today. It is known as Gaudete Sunday because the opening words of the Mass coming from Scripture, “Rejoice”, coming from the Latin Gaudete –rejoice — is the entrance antiphon for today and the controlling idea of the second reading from Philippians in Year C of the lectionary cycle (“Rejoice in the Lord always; again I say, Rejoice! The Lord is near!). On Gaudete Sunday the priest may wear either violet or rose vestments and we light the rose candle on the wreath. This custom of rose vestments is a 10th century practice (one that we observe on the Fourth Sunday of Lent (Laetare Sunday). In the season of Advent, the color rose is a sign of anticipatory Christmas joy as it also marks the midpoint of Advent. Up to December 16 the Liturgy focuses our attention and preparation on Lord’s coming at the end of time; then as time nears the Nativity (December 17-24) we begin to prepare for the celebration of Jesus’ Nativity on the feast of Christmas. Joy is the basic Christian attitude; no joy, no true and authentic Christian discipleship. 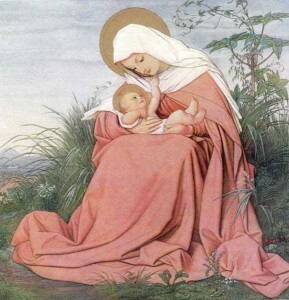 Mary, the Mother of God is also the first disciple of joy! Even she is clad in rose!!!! Today, we locate ourselves in the second week of Advent. (I hope I am more centered this week than I was last.) The Church hears from the Lord’s cousin, the Forerunner and Prophet John the Baptist in the gospel reading. Saint John is rather mysterious and yet he’s an attractive figure who has the unique work of pointing us to the Kingdom of God unfolding in front of us; he also points out the Messiah. That’s exactly what we attempt to do within the various communities to which we belong: family, parish, religious, work, and social. The mature Christian (or the one who takes his or her spiritual life we seriousness) takes up the Baptist’s work of doing what he did: bring others to the Lord. Each with his own work. The outward role in salvation history of Mary and Joseph, Simeon and Anna are very different, as is with John the Baptist, but also with each one of us sharing the Good News.